NUMBER 9: Theatre, Music and Film: King Lear (Alone) - The International Anthony Burgess Foundation, Manchester. King Lear (Alone) - The International Anthony Burgess Foundation, Manchester. While condensing a three-hour tragedy with 27 characters into an hour long one man show may seem to be an impossibility, Writer-Director Frank Bramwell and performer Bob Young prove themselves to be more than up the task with this enlightening take on Shakespeare’s classic. The decision to stage the piece with a solo performer isn’t merely the result of a desire to impress with virtuoso acting but is key to the play’s emphasis of Lear's loneliness and estrangement from his family. King Lear is not only alone on stage but also in every sense of the word 'alone'. The resulting piece offers a humanising look at the legendary king, as he grapples with advancing age and the consequences of his poor decisions in the past. While he may proclaim that ‘the past is another country’ it continues to haunt him and control his present. The intimate performance space at The Anthony Burgess Foundation provided an apt setting for this stripped back take on the tragedy, with the production’s minimalist staging serving as a perfect backdrop to Lear’s confused state of mind. Lear frequently asked himself who and where he was, even addressing the same questions to the audience at times. This brought the audience closer to Lear as a character, particularly as the setting remained ambiguous to the audience themselves, so we shared his confusion. The other characters in the play maintained a showery presence in the narrative, not just through the damage they have inflicted on Lear (and the damage which he eventually admits to having done to them) but also through the stage design. The looming tree at the back of the stage is entwined with blank masks, representing the many characters whom Lear attempted to recall and define as he brooded over the events which led to his current predicament. Most poignant of all is the small figure of Cordelia, hanging by her neck from the tree. This is a clever representation of what Lear dubs ‘a doll-like reminder’ of his favourite daughter. The moment when Lear finally refers to his daughter, confronting how his actions have led to her death, is the highlight of the play. Young’s powerful performance holds the audience’s attention, and Lear is by turns petulant, arrogant, self-loathing and deeply needy, yet he always retains some degree of sympathy even as the play refuses to gloss over Lear’s intense flaws. Some of the more moving moments came as he struggled with the simplest of tasks, such as gingerly lowering his infirm body into a chair, or endlessly repeating the same dialogue over and over, unable to remember what came next. 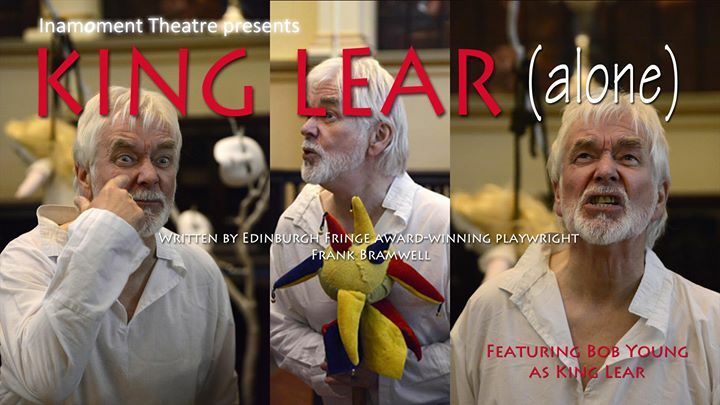 I was left at the conclusion thinking that Lear’s identity crisis, while exacerbated by his dementia, is not just the result of ageing but part of a life long failure to ever properly understand himself or the people around him. The only responsive left for Lear is to resolve face whatever comes next with as much bravery and dignity as he can muster.